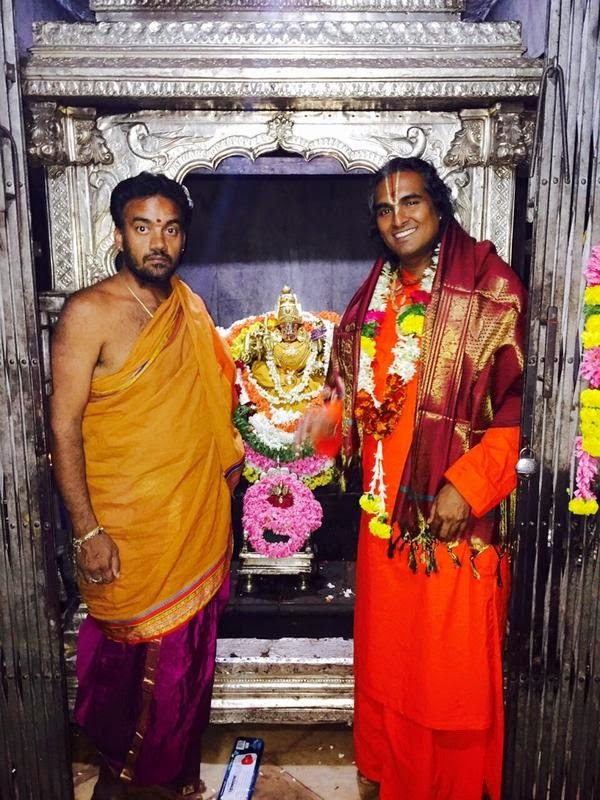 Paramahamsa Sri Swami Vishwananda / Bhakti Marga: South India Pilgrimage: Day 11. Journey to Mysore. 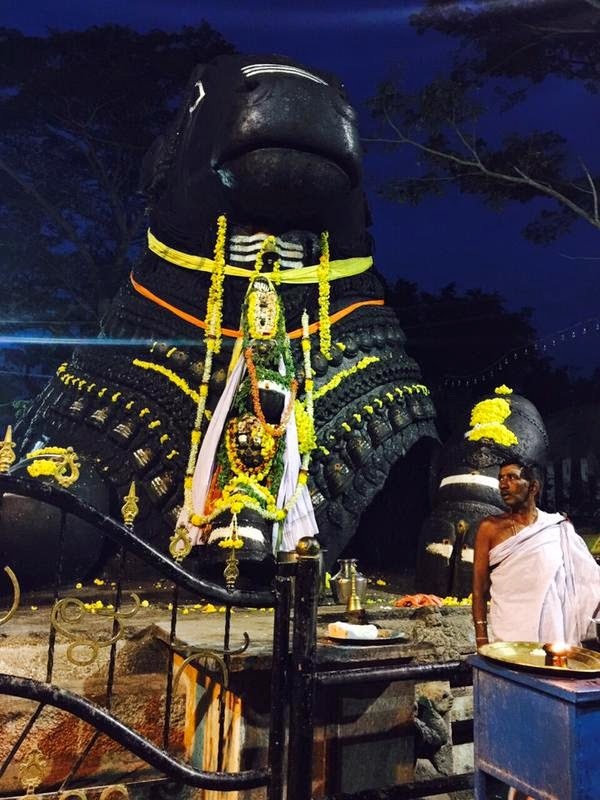 South India Pilgrimage: Day 11. Journey to Mysore. The morning started off foggy and cold in the mountains of Ooty. After breakfast we set out on a 150 km journey to Mysore, the land of sandalwood. Although the drive felt long, it was quite a scenic route; descending through the mountains on the winding Indian motorways. About two hours into our drive we passed under an archway that read, "Bandipur tiger reserve." Our anticipation grew as all eyes turned to the forest, we were all in hopes of catching sight of some exotic animals. “Monkey!” someone shouted from the middle of the bus, we slowed down for long enough to capture a few good shots on our phones, people spoke of Hanuman and we were off again in search of a tiger! 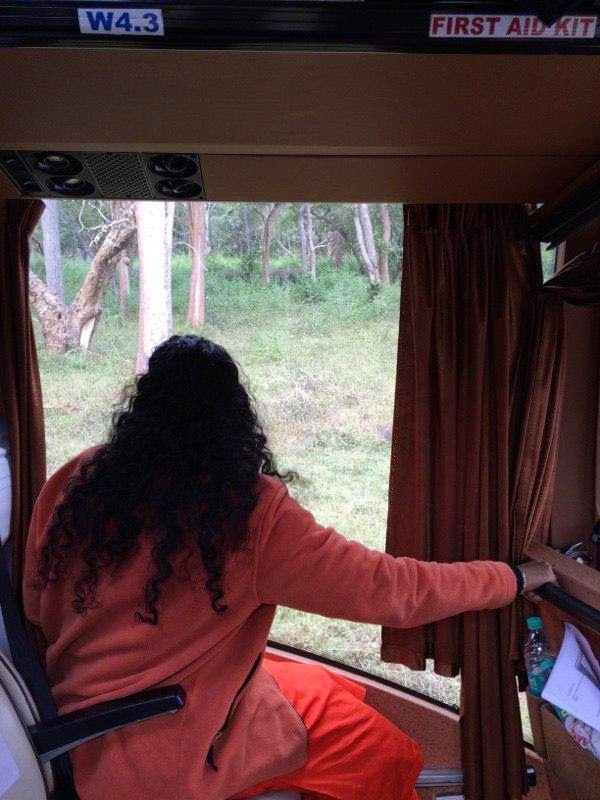 We travelled a few more kilometers and another shout echoed from the bus, "Elephant!" We stopped again and there was talk of trying to get out of the bus to get closer and get a better picture. Ultimately, we decided against it due to the impending threat of tigers! The wheels of the bus started spinning; we were making progress again. A few more elephants and deer were seen later but we were exiting the reserve without any sight of tigers…. For lunch we were invited to the house of a devotee’s mother. They received us with open arms and immediately after Guruji arrived, a pada abishekam was done on his feet and he was given flower garlands. 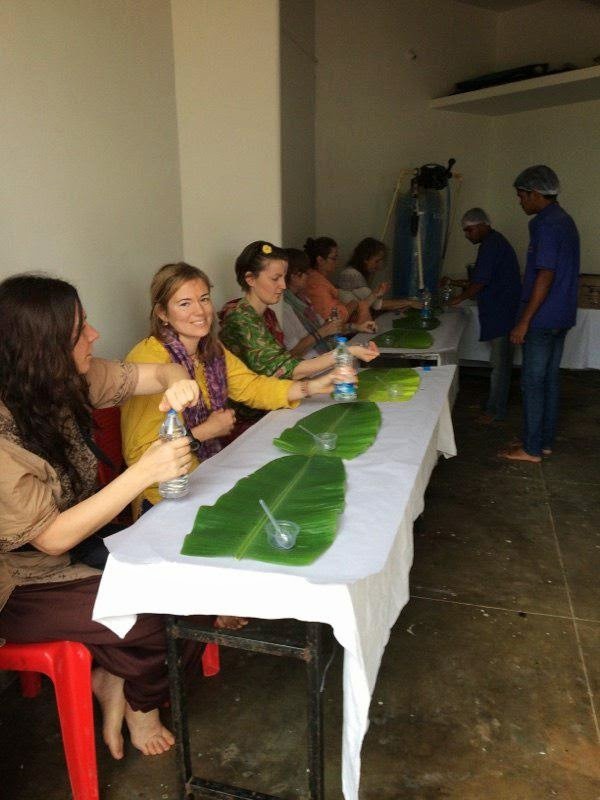 For lunch, we ate some incredible Indian food, using our hands as cutlery and banana leaves as plates. When the time came to leave and make our way to the next temple, all the women were gifted beautifully embroidered shawls that Swami had blessed prior to being handed out. 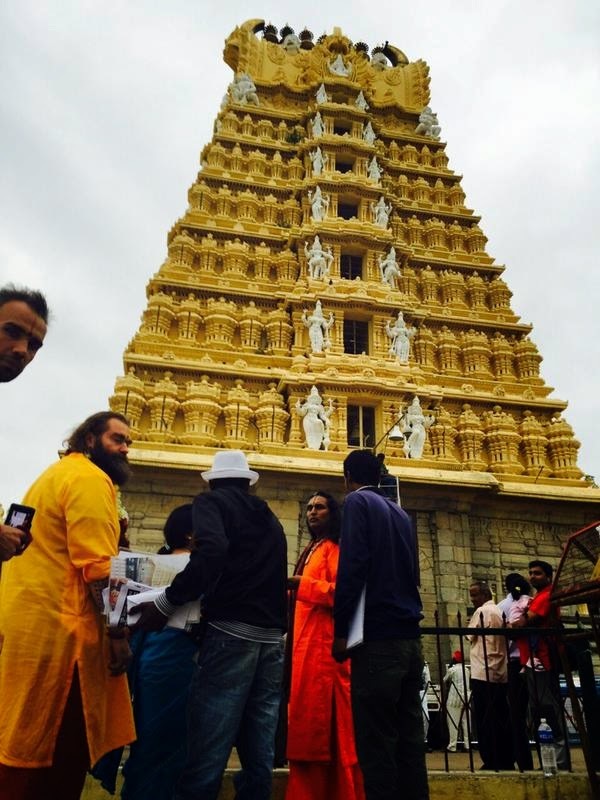 A special puja was arranged for us at the famous Sri Chamundeshwari temple on the top of a hill over looking Mysore. While we were en route to the temple, word got out that westerners would not be allowed to enter the temple. As we arrived somehow, the strings were pulled and when we showed up at the temple, not only were we allowed to enter, but we also received V.I.P. treatment! We were ushered directly to the front of the line and got told to wait while the puja took place on the Chamunda murti. Later on we had to pay attention to the many monkeys that were climbing throughout the temple ready to pounce at any moment! After spending enough time at the temple, we went to a cave where it was reported that a saint who lived for over 350 years was staying. 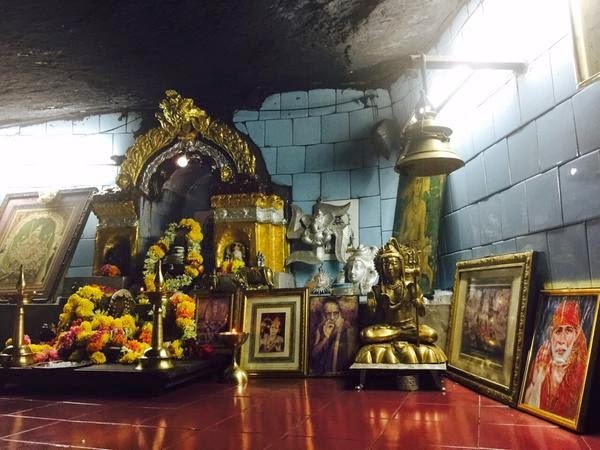 Swami told us when we go into the cave, it’s like stepping into a whole different universe. 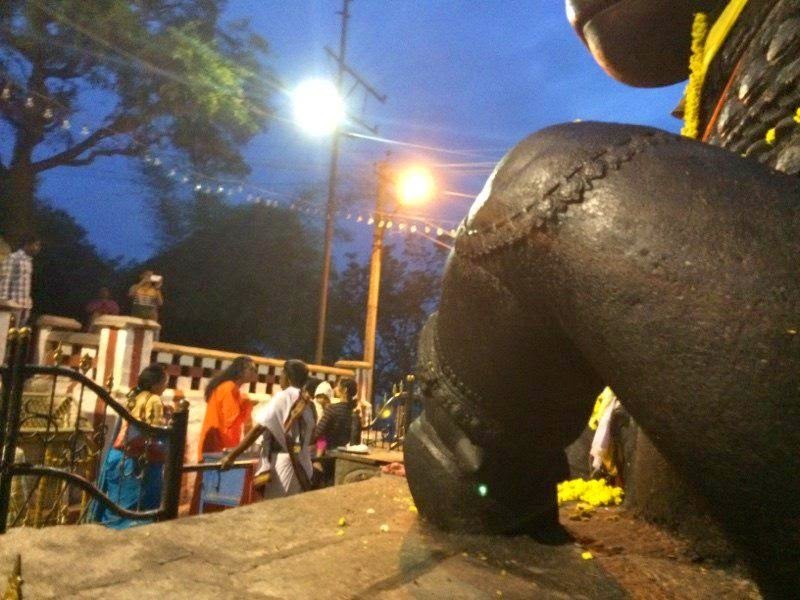 We made our decent down the hill and just outside of the saint's cave lay a gigantic Nandi. When we stepped through the small narrow doorway into the cave, we all noticed that there was a strong energy and a very high vibration, some of us stayed to soak up all the good vibes. 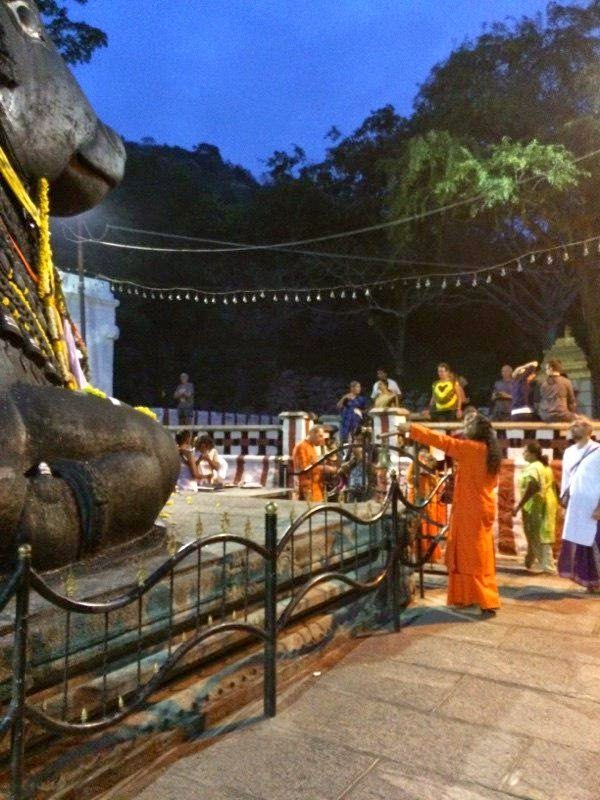 Nandi, the vahana, or vehicle, of Lord Shiva. When we exited the temple into the large square that had been converted into a market, we were bombarded by salesmen trying to get us to buy everything from little wooden Ganesha murtis to pictures of deities. “No,” is not a word they have in their vocabulary, and the more we tried avoiding them, the more they urged us to buy some merchandise. Continuing our journey, the plan was to go by two more ashrams before retiring back to the hotel. At the first ashram, westerners were not allowed to enter again, but just as before after Swami talked with a few people and worked his magic, they gave us the "Okay," to enter the Nanjunananda ashram. We walked around for a bit and recived darshan from the place where a great saint took his Maha-Samadhi. In the blink of an eye we were out of that ashram and onto the next one. Our last stop of the day was at the Sri Ganapathy Sachchidananda ashram, which delivered an unexpected treasure of a moment. Sitting on top of the first temple we saw a gigantic Hanuman murti that was immediately juxtaposed by Swami’s orange robe. 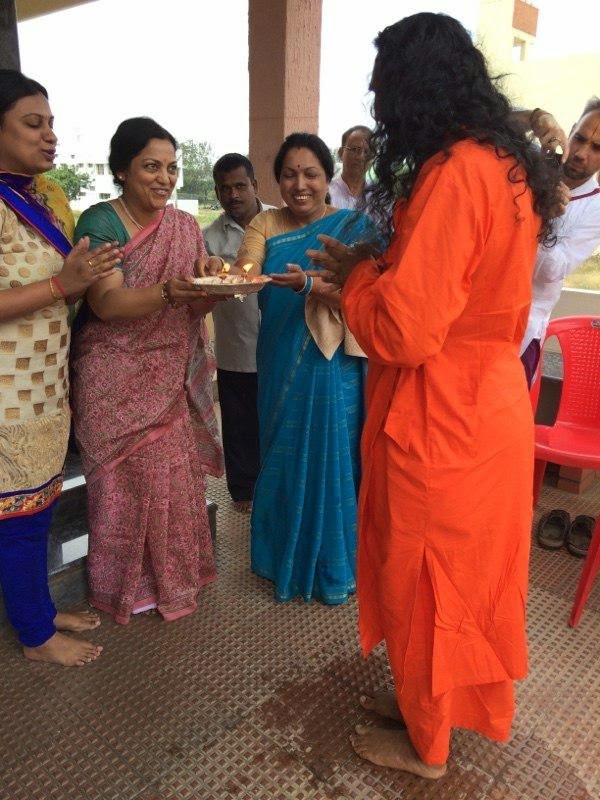 Gurudev received a warm welcome from the ashram residents, who offered him an orange shawl complimented by a flower garland. A beautiful ambiance was created and the sacred space of the temple gave way to a joyous moment of bhajans. The singing was contagious and we let ourselves go deeply into the sounds of the Divine names. Although, in the beginning it was just our group singing, the bhajan’s vibration quickly attracted a crowd of students that were eager to join together with us in song. We lived and felt the devotional energy together, and for that moment the hall reverberated with the unifying force of bhakti. Like bees to honey, the group of young devotees came to show their love and recognition of being in the presence of Gurudev. As we came to the completion of our scene, this charming group of students swarmed Swamiji, bowing at his feet, asking for pictures, and expressing their love and joy around him. 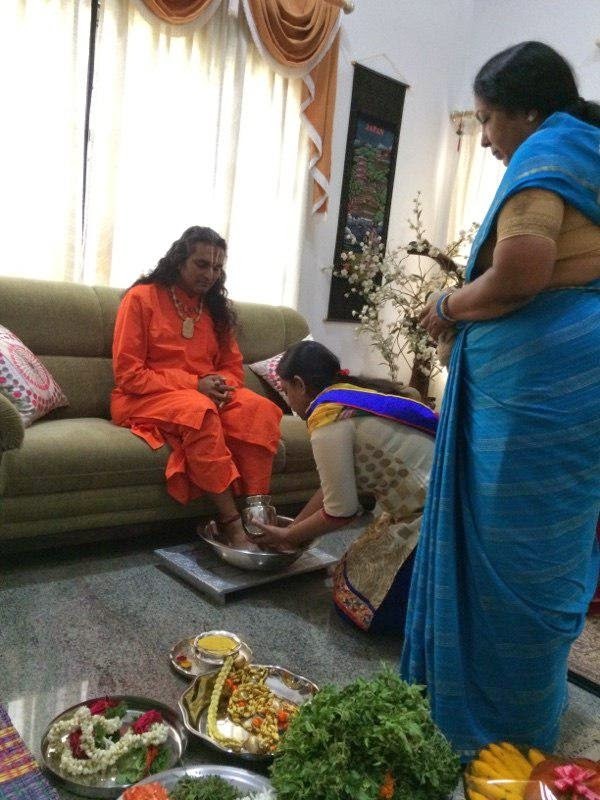 Guruji was then invited to go inside and help with the arati ceremony. The curtains closed and although we weren’t able to see Swamiji anymore, we were still buzzing from the bhajans that had just taken place. The ceremony finished and our time to return to the hotel had come. After another day surrounded by the divine energy that Swamiji offers us, our hearts were completely fulfilled. Thanks to all for an experience of a lifetime.